One common culprit behind basement flooding is rain. Excessive amounts of rain in a short period of time can saturate the earth around your basement and then push in through foundation cracks. 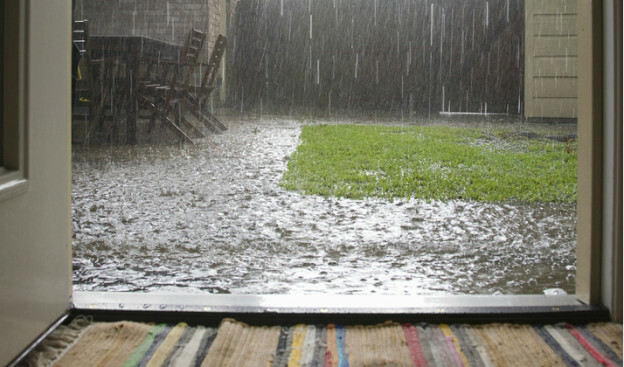 The slope of your lawn can also contribute to your basement flooding. Your lawn should always slope away from your house, directing rainwater toward the sewer system. Take a walk around your home when it’s raining. If you see water pooling next to your house, you may have a problem. Sewer backups also cause basement flooding. Many homes have a sewer tie-in line that is lower than the floor of the basement, allowing dirty water from tubs, toilets and sinks to be carried away. If this sewer line becomes clogged or damaged and its waterline rises above that of your basement floor, expect water to come rushing back into your home. A sump pump failure can also cause flooding. Sump pumps are set in basins drilled into the floor of the basement and act as a fail-safe by mechanically pumping out excess water. Experts recommend installing a back up sump pump in case the primary pump fails. The costs to fix basement floods and their damage can vary significantly. The length of time the water sat can also affect the price to repair the flooded basement because of mold issues. The experts at Smart Restoration Services can handle all phases of restoration, remediation and reconstruction. Contact us at 847.577.2900 or contactus@smartrestorationservices.com.